Lila Bradshaw chose this single word to describe her father. Jack Holcomb, a leader in his local and regional agricultural cooperatives. In the aftermath of the September 11, 2001, attack on America, Bradshaw, like many Americans, was emotional and fearful of the future. She turned to her father for some comfort. At 100 years old, Holcomb has experienced both great hardships and great joy in his life. One of three children, Holcomb was raised during the Great Depression. His father was a real estate developer. At 10 years old, his family moved from Miami, Florida, to Port Isabel, Texas. When the Great Depression began, his father lost all of his customers in the years that followed. There was no longer a need for his profession, and he was unable to find work. Holcomb took a paper route at age 10 where he could make five dollars per week. His family lived for three years on the money he earned. At the age of 18, he took a job as an engineer on a railroad. Holcomb also worked as an engineer on the project that dug the Brownsville Ship Channel. I was going to build a home on it. Well, it was 10 years later that I came back and built my home. I have been here ever since.” Holcomb has farmed in the Progreso area since he moved there. “I was so conservative that I did not work on borrowed money. I worked on my own money,” Holcomb said. “I bought more land when I could, and I kept it.” Holcomb started out his farming career with citrus. After a freeze knocked out his crop, he began row-crop farming. Holcomb still manages the finances on the farm, and he has partners in the operations that run the day-to-day farm activities. 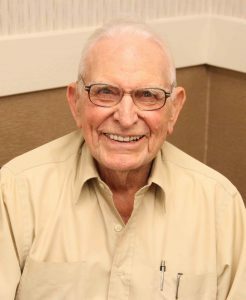 At 100 years old, Holcomb still serves on the board at his local coop gin, Progreso Coop, as well as on the board of Valley Cooperative Oil Mill (VALCO). He said one of his favorite parts of being part of the coop gin is the chance to visit with other farmers over coffee in the mornings. Holcomb also said it allows farmers to help one another and share information. Today, Holcomb has two children, Lila Bradshaw and John A. Holcomb, six grandchildren and five great-grandchildren. When he had children, Holcomb said his primary goal was to give them everything he didn’t have growing up. “My biggest goal in life was to have my children go to one school, and they were going to graduate in that same school,” Holcomb said. “We weren’t going to move so they could have friends and all like I didn’t have because I went to school in five states. My children were also going to get a college degree. I wasn’t going to say where, but they were all going to go to college,” he recalled. Holcomb succeeded in fulfilling his goal. All of his children and grandchildren earned college degrees. Bradshaw said her father and late mother were both incredible role models for them growing up. She said her mother encouraged them to love to read and learn, and her father was an example of an impeccable work ethic and commitment. Holcomb said he hoped he passed down to his children, grandchildren and great-grandchildren that honesty is the most important thing in life. He also said he has been very lucky throughout his life. Throughout his life, Holcomb has enjoyed the journey. Even though he faced some difficult hardships in his life, he has created a legacy that will last for many years to come. His positive attitude and honest values have set a wonderful example for his children and paved a way for his grandchildren and great grandchildren to follow.